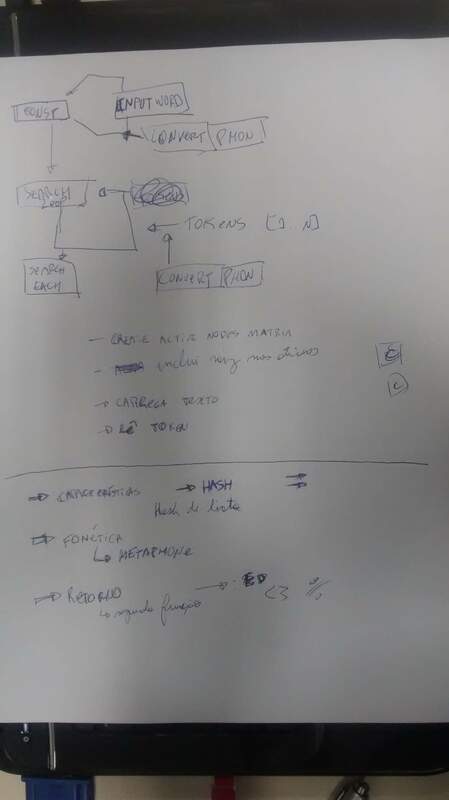 Creating drawings of an architecture, an algorithm, or even writing a full algorithm in the blackboard or in a piece of paper are an important step when doing research and development in Computer Science. There are some tools that enable to do online drawings, but I prefer the hand-coded ones! 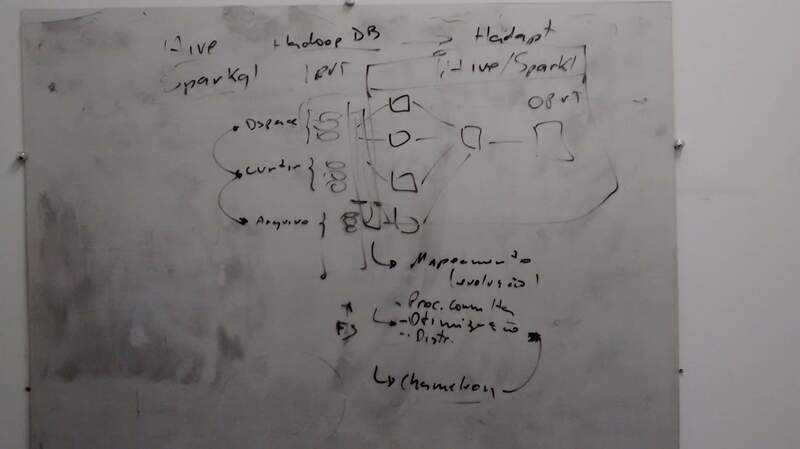 Recently, I have been browsing through my photo gallery (in some existing Cloud), because I need to free some space, and I found some pictures of my office blackboard, which I called “research drawings”. By coincidence, I was recently chatting with a colleague about the great (or bad) ideas that we draw in the blackboard, and how some of them yield research subjects, master and Phd works. Some haven’t been published at all, either because they were bad or because we just forgot or didn’t have the priority to develop them. If we would save all our research drawings, we could have a research history, with successful (or not) cases. Either way, it always gives a picture of some work. This drawing was not made by myself, but by one professor here in the department, in a group meeting we had. It is one of my main motivations for taking pictures from the drawings. It was taken around 2012/2013, while we were designing an architecture for querying over multiple data sources ( a Polystore??). We haven’t published the main idea, but smaller parts, such as the Chameleaon tool (main authors: Edson Ramiro and Eduardo Almeida) were nice results. The following one, done on 2015/2014 was to understand a specific kind of TRIE tree. I finally understood, and we integrated it with a phonetic encoding in an Approximate String Matching approach (published this year at ADBIS). The main authors were Junior Ferri and Hegler Tissot. This one, also in 2015/2016 is about the same ASM work. It shows the flow of operations to encode search over a TRIE encoded with phonetic information. 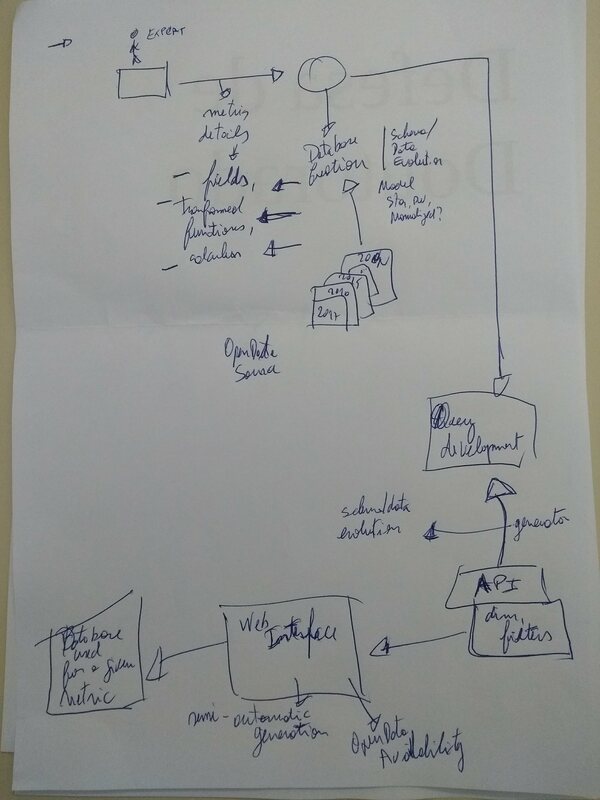 Finally, this one is the general flow of our Open Educational Data Laboratory. It was drawn in 2018: I remember the year because it is quite recent. 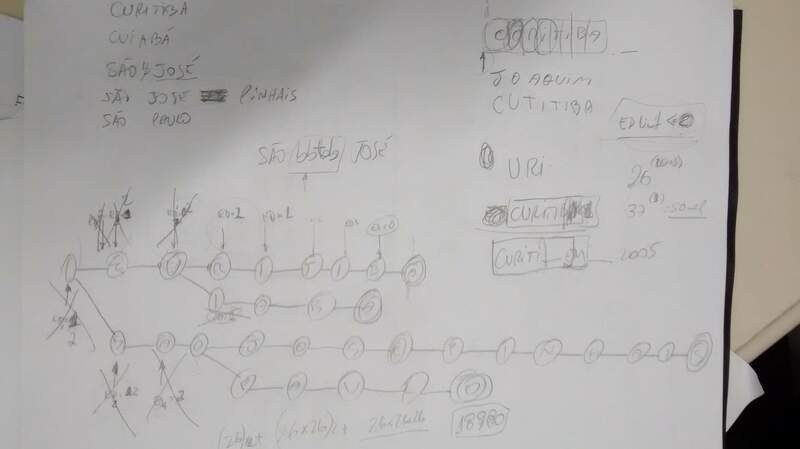 In this work, we extract open historical information about education in Brazil (from kindergarten to the graduate studies) and we publish them in an online platform. There is an article at ICWE this year as well. This one have several things yet to be worked on!